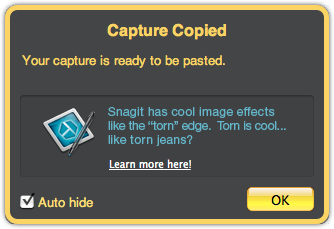 ﻿ Where is the Jing Capture That I Sent To My Clipboard? Where is the Jing Capture That I Sent To My Clipboard? You may have captured an image or video, clicked an output button, and wondered, "Where in the world did my file just go?" Maybe you have seen a message like this, but found the message confusing. What's happening is that Jing is copying a URL (hyperlink), file path, or other content to your clipboard. The clipboard is a little tough to explain because it's a computer metaphor that you can't see or touch, but you've likely used it without knowing it. Consider a word-processing document. You want to move some text around so you highlight a sentence then click Edit > Cut and move the cursor to where you want the text to be placed. Then you click Edit > Paste. Almost magically, the text that was gone reappears. Where was the text while in between the cut and the paste? It was on your clipboard--a little place in your computer that remembers one thing for easy retrieval. Jing uses the clipboard too. When you copy an image to your clipboard or share content to Screencast.com, Jing stores (remembers) the image, URL (hyperlink), or other content on your clipboard. It's kind of like Jing automatically does that first step--the copy part--for you. Then all you have to do is paste the content in any supported location. I capture an image and click the Copy button. At this point Jing copies the image to the clipboard and considers its work done. I switch over to my PowerPoint presentation and paste it in using Edit > Paste in PowerPoint's menu. I record a quick video and click the Screencast.com button. Jing uploads the video to my Screencast.com account and once it's privately hosted on my Screencast.com account (on the Internet), Jing gets a URL (hyperlink) with the location of my video. Jing then copies the URL onto my clipboard. I paste the URL from my clipboard into an email I am going to send to many of my friends.